Did I forget to mention Team Timeless? oops! Between everything happening around here I completely forgot to announce Team Timeless, and introduce my first tutorial with them!! Team Timeless is a group of 4 designers chosen by Timeless Treasures. Each month, a new designer will showcase a Timeless Treasures collection and present a tutorial for it. 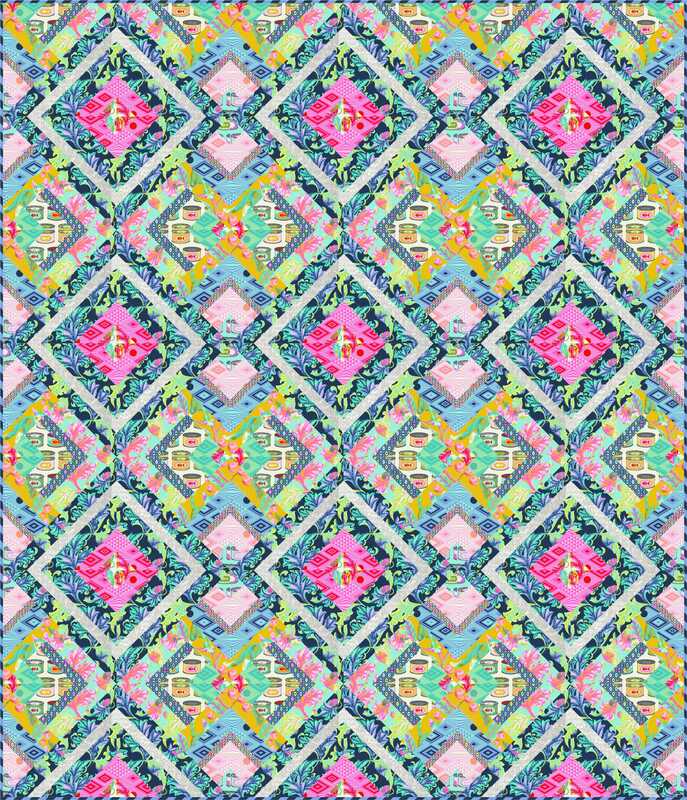 I got to play with these bright, colorful prints from Crayon Party collection. So of course, I had to make myself some big bold crayons! I called this quilt Scribble, inspired by my littlest kidlet. He loves to color anything with everything! Scribble is made using half yard cuts of both prints and backgrounds. My best friend’s farm was the perfect setting for photos. and afterwards, I donated this quilt to her school fundraiser. She holds a lot of quilts for me whenever I ask, it was the least I could do! I quilted it with all over swirls and scribbles, like a doodling pencil line. Zip on over to the Timeless Treasures blog to find the free tutorial to make your own Scribbles quilt. Perfect for the little ones starting school this month! It goes together quick and easy. And while you are there, check out what the other designers are up to as well. There is so much to say and so little time to say it in! As always, September and most of October was a time of writing and sewing in preparation for Fall Quilt Market in Houston, TX. This year I had a number of new designs with FreeSpirit Fabrics. Since quilters are mostly visual, this is going to be a picture heavy post. Flock Together is a 100% Stacey Day design. 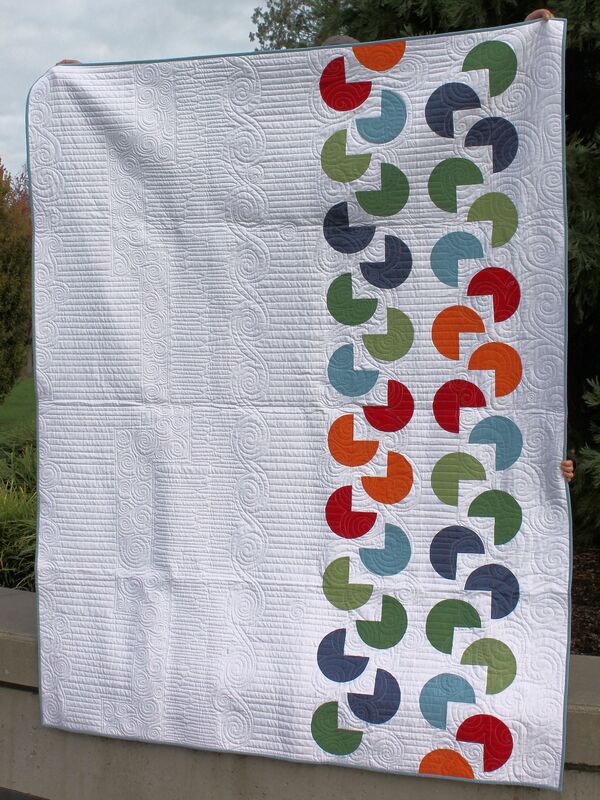 From digital design to the final stitch in the binding, this quilt was my favorite to put together. It utilizes a jelly roll and is super fast to whip up. The pattern is a free one and available by clicking here. 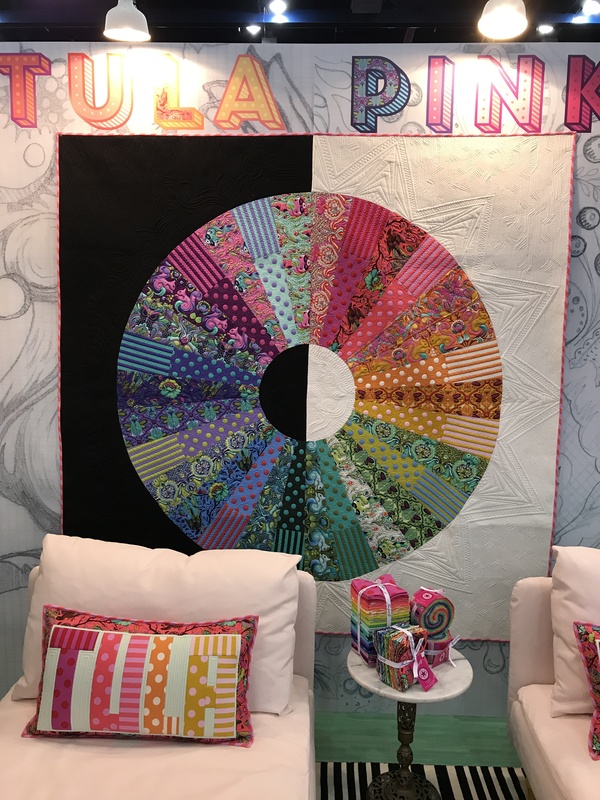 Center Stage was a collaboration with Tula. I had a much lighter hand than usual with this one, but the instructions were all me =) It’s a stunner and I love it! I believe this will be a free pattern from FreeSpirit. Finally, there is the Pom Pom quilt for All Stars. This one is a stunner. 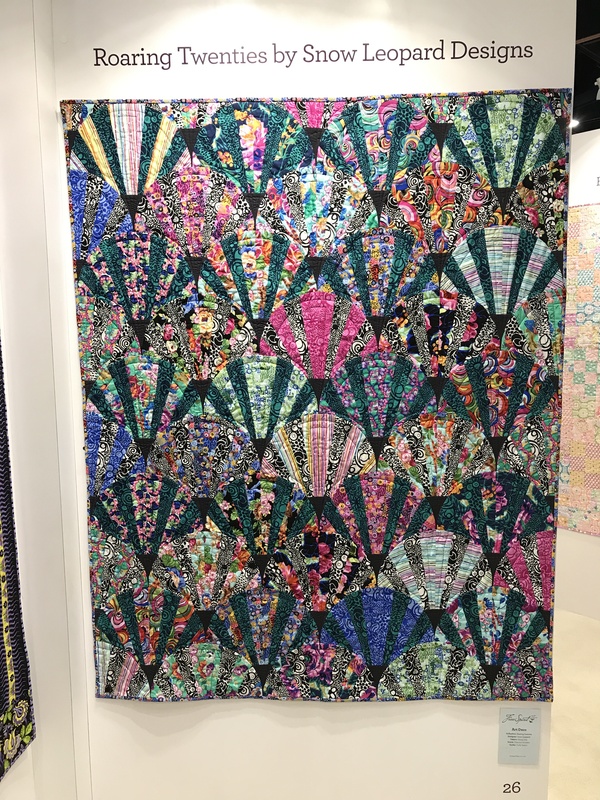 Check out that quilting by Angela Walters! 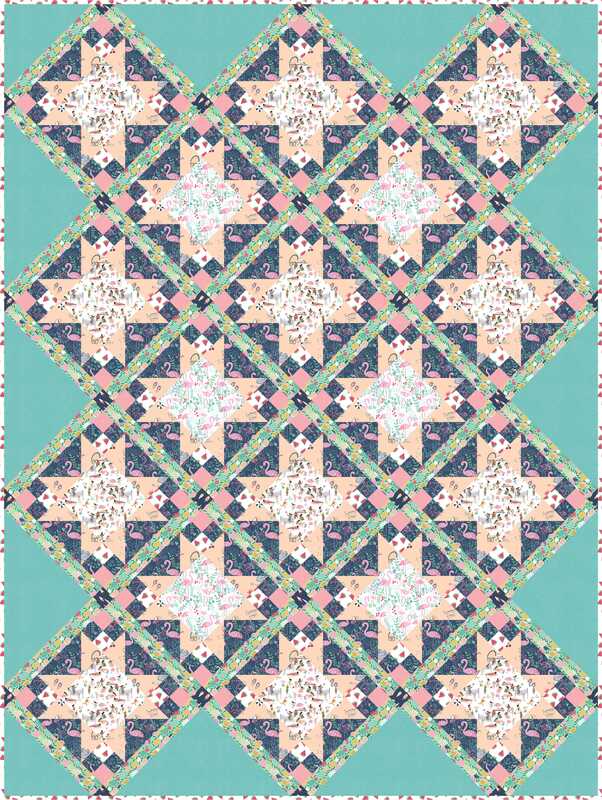 This one is another collaboration with Tula, and the pattern will be exclusive to the quilt kit. Then we mosy on over to Joel Dewberry’s new collection, Avalon. Arise! was inspired by the legend of Excalibur, how it rose from the depths in the hands of the Lady of the Lake. I wanted simple pieces to show off the prints to their best. There were two Arise quilts made for Market, this one by an unknown-to-me quilter who did a lovely job, hanging in the gallery. Mine hung in the main booth where all the ordering took place. 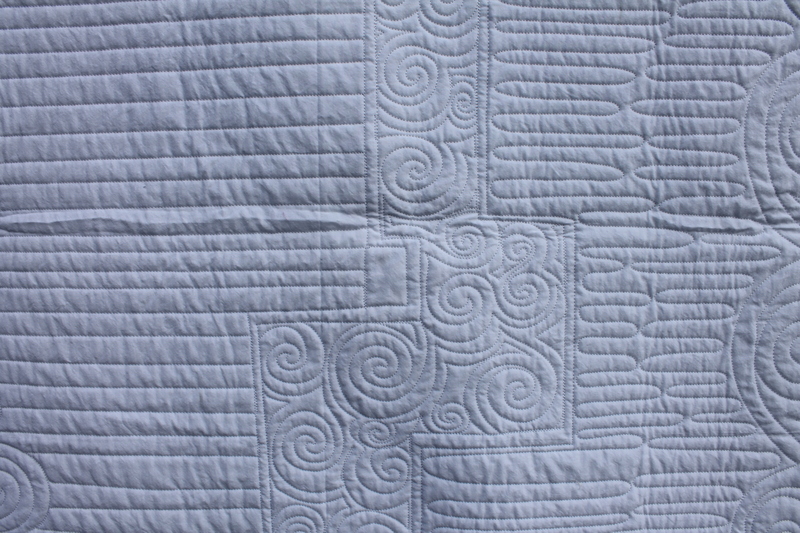 I quilted mine in straight lines and swirls.I am really enjoying the ribbon candy these days. I used my new favorite Designer Solid, Mineral. It’s a gorgeous green-blue hue and it goes with everything! And of course I had a little helper taking photos. peek! Checking out Mommy’s work. For Art Deco I wanted to channel some classic architecture but add a bit of modern flair. I added the inserts into the clamshell, and the written pattern has optional bias tape around the top curve of each clam. This really makes the individual clamshells pop. The collection is gorgeous. Shout out to the same unknown maker for this one. Sugar Beach is a bright and vibrant collection. it was a ton of fun to design with. I wanted to give the feeling of floating on the water, fruity drink in hand, on a hot summers day. I’m pretty sure it comes through in this one. Finally there is Fashion Show. The Dress is based on her very popular class by the same name. You can’t see it very well in this picture, but I quilted each wedge with a trio of feathers. I did a meander and outlined each dress panel, and the sashes are quilted with – you guessed it – ribbon candy and straight lines. This quilt didn’t hang at market, it was being used elsewhere. 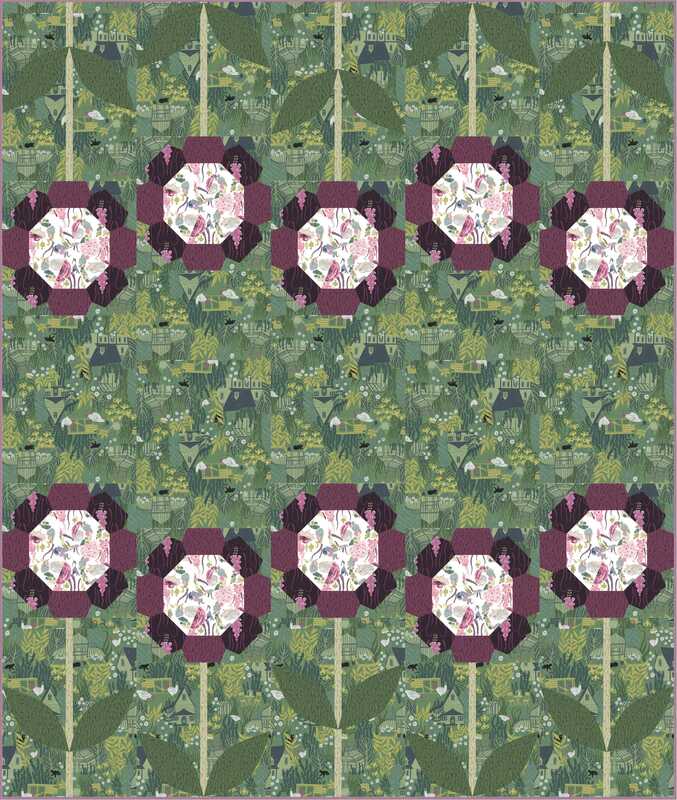 I also had the pleasure of designing a retro quilt for FreeSpirit’s house designed collection, Boston Commons. It is a gorgeous, deeply vibrant hued reproduction collection. That golden yellow is perfect! 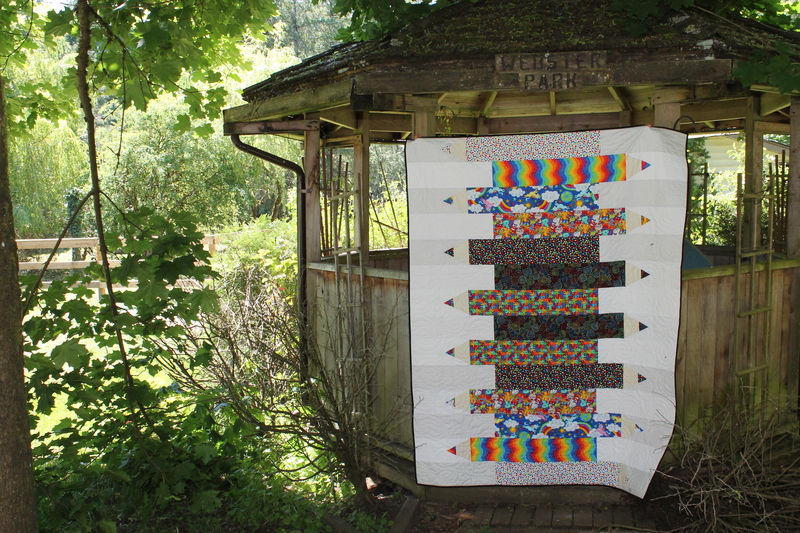 I quilt is a modern take on the classic log cabin block, and very easy for a beginner. Thank you to my friend Lindsay who walked the show floor and took all the photos for me. I will update the pattern links as they become available under the FreeSpirit tab in my Free Patterns dropdown menu. All but Pom Pom will be a free pattern available as the collections come out. 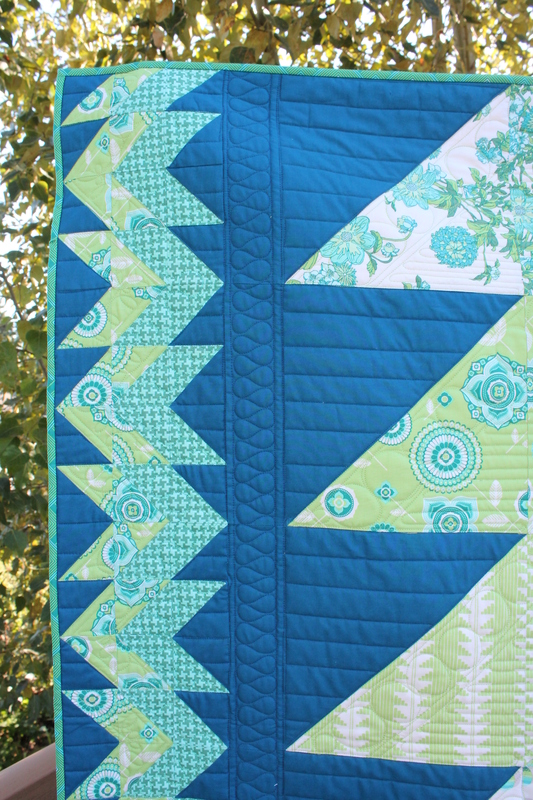 Terrace Garden Quilt Tutorial and giveaway *winner announced! A few months ago I got to play with some gorgeous new prints from a brand new FreeSpirit designer, Amy Reber. 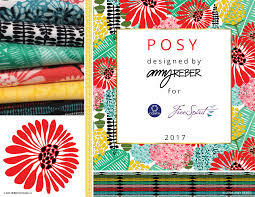 Her debut line, Posy, is a visual wonderland of bright bold prints and colors. 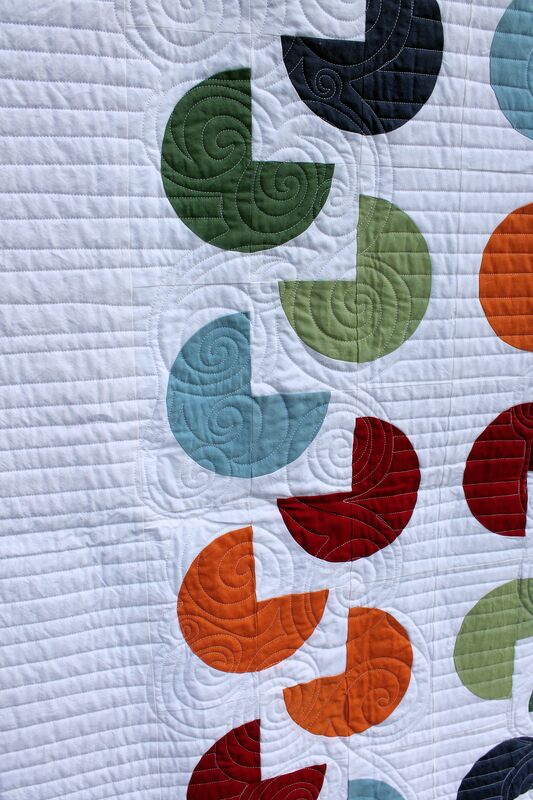 The three individual pallets are perfectly balanced and work well individually together or in a group quilt. I wrote a free pattern for the line called Blossom. You can find it here. Blossom uses the Rosa color group, but you could easily swap out for Julep or Abelia, the other two color groups (aren’t those names just delicious?) There is a shop as well that is carrying the pattern as a premade kit! I had a hard time trying to narrow down my favorite prints, they are all pretty great! 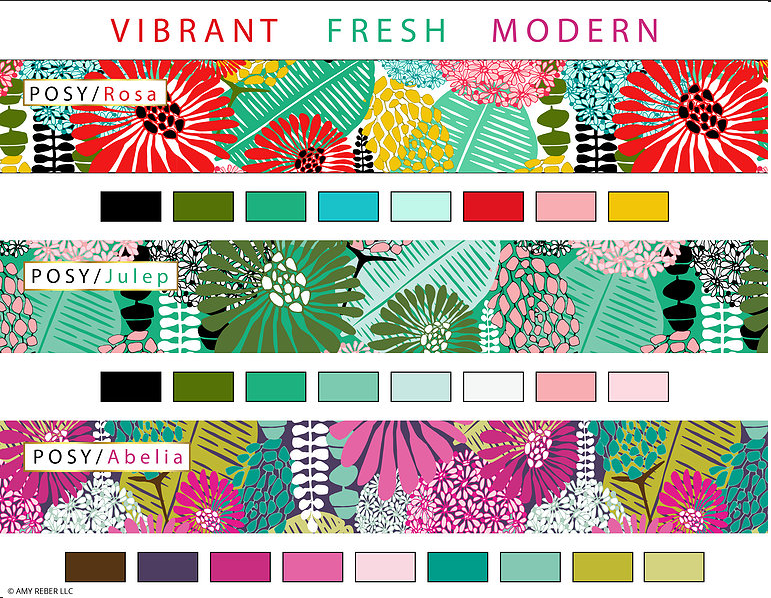 At the very top of my list is the main print – Bunches. It contains many of the individual elements in a gorgeous collage setting. 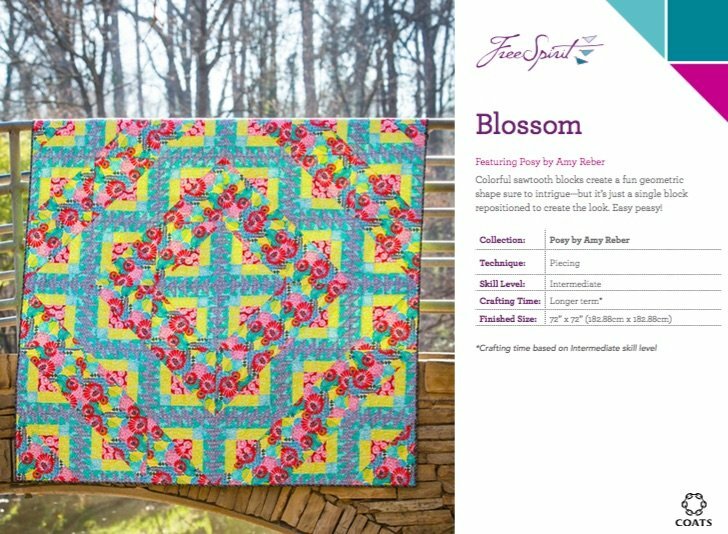 This is the print I designed teh entire Blossom quilt around. Then there is Perfect Petal. I love the purple hue, and the black and white is so striking! Then of course is the Sunglow Stripe. All three colorways make perfect blenders. With my bundle of Posy, I decided to make something quick and simple that would show off all the prints to their finest. I decided to use Half Rectangle Triangles. I feel like HRT are an underrepresented quilt block. They are super fun to make and showcase large prints to great effect. Say hello to Terrace Garden! 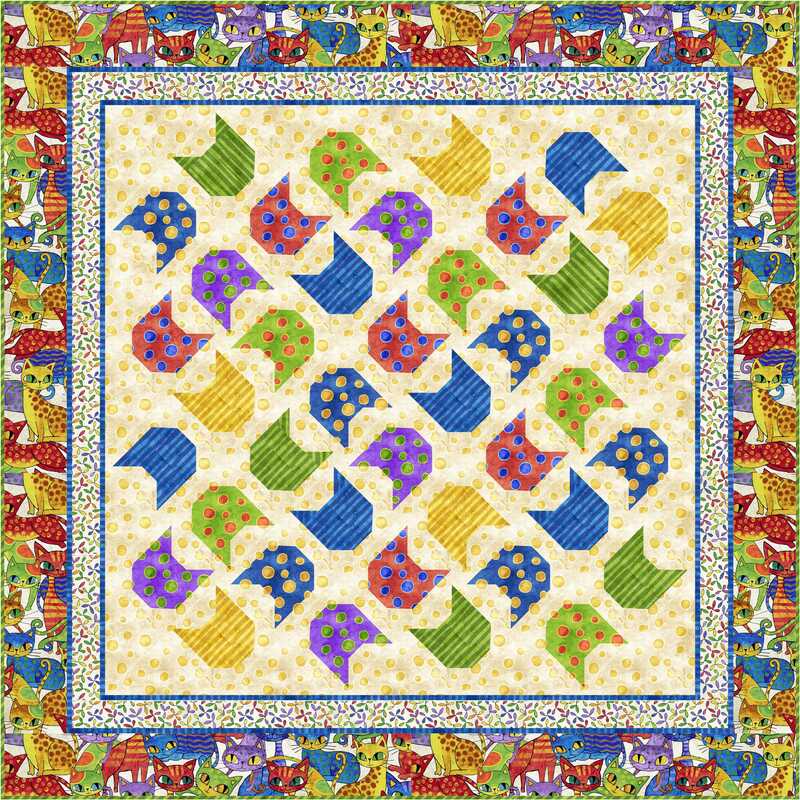 The prints are showcased perfectly, and to soften the hard edges of the block shapes I used an all over swirling design for the quilting. 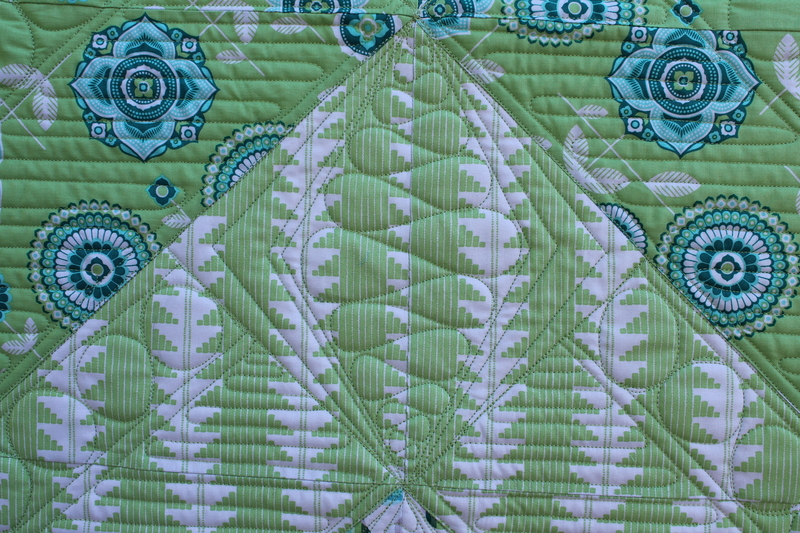 I used a dusty teal thread for the quilting that matched the prints. All seam allowances are 1/4″. Press seams open. 1. 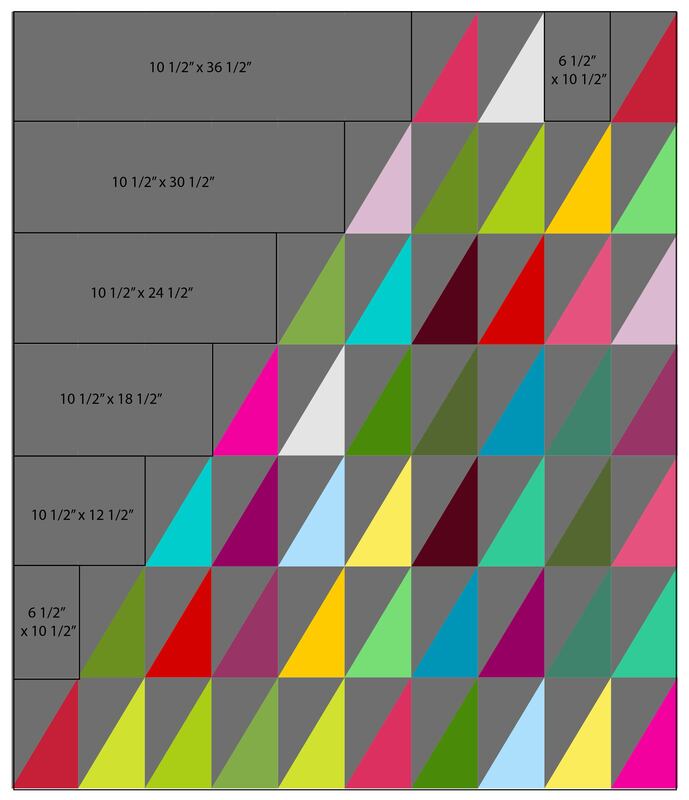 Stack the print 6 3/4″ x 11 1/8″ rectangles right side up in groups of 6. Cut the rectangles in half on the diagonal as shown. Repeat with the gray solid. 2. Sew a gray HRT to a print HRT right sides together as shown. Press. Repeat for all gray and print HRT. 3. Using the layout diagram as a guide, sew the HRT and all gray rectangles together into rows. 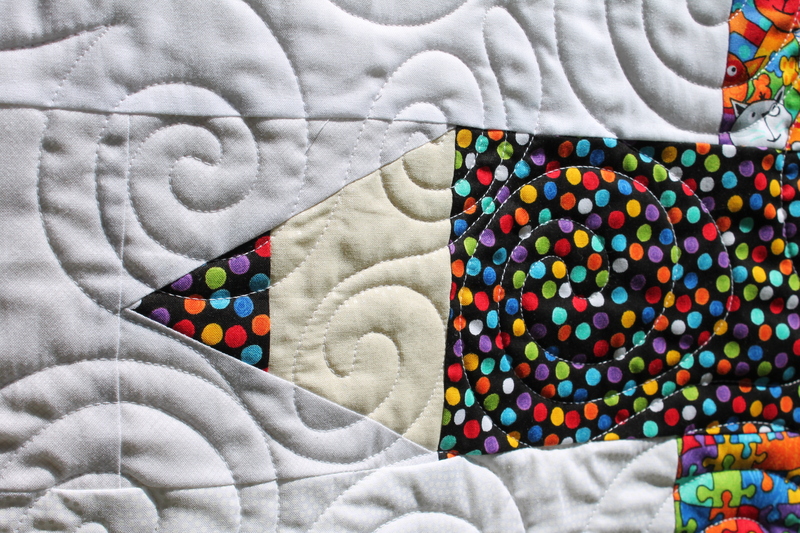 Press, then sew the rows together into the finished quilt top, matching seam allowances carefully. 4. Cut a backing approx 68″ x 78″. Layer the backing, batting, and top. Quilt as desired. I am offering up a pair of precut Posy bundles that you can use to make your own Terrace Garden. 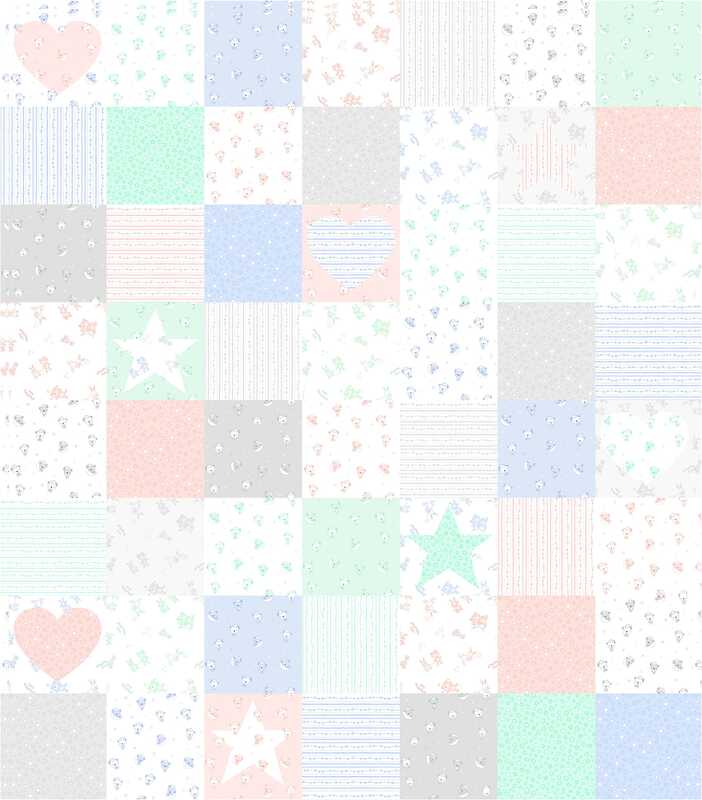 Just add your own background fabric! I will be giving away one here, and the other on my Instagram account @staceyinstitches. You can earn up to FOUR chances to win! Follow me here or on Instagram, and leave a comment on this post telling me where. 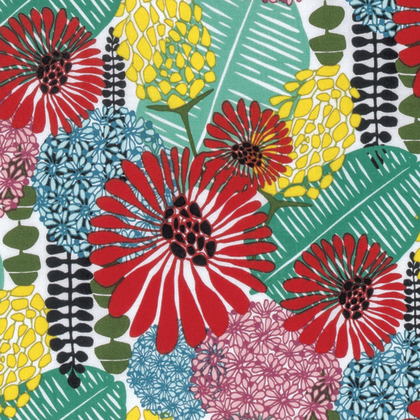 Leave a second comment telling me your favorite Posy print. Follow Amy Reber @amyreberdesigns on Instagram and leave a third comment letting me know you’ve done so! Share this post! Then leave a comment telling me where for a bonus entry! If you follow me on Instagram you can enter on my IG post for a chance to win the second bundle. That’s it! I will run the giveaway until Friday at 4pm PST. 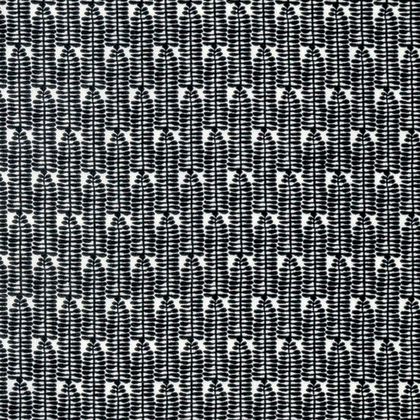 Winning fabric is a great way to kick off a summer weekend, don’t you think! My favorite print is Posy Bunches – Abelia because oh.those.colors! 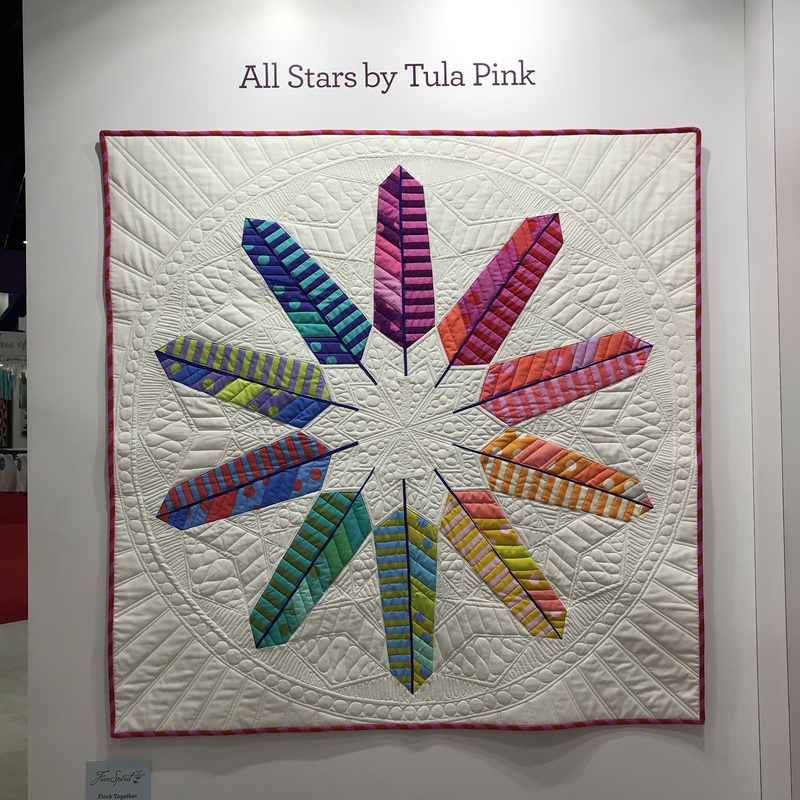 Tabby Road from Tula Pink is finally hitting the shelves at your Local Quilt Shops! 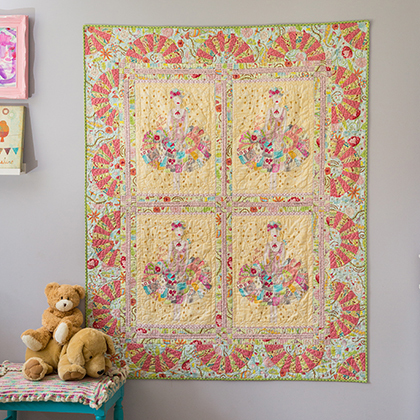 I designed a couple of quilts for this one, and Twist and Shout is the last one to be released. It’s well worth the wait, as it is a free pattern! This one is super fun you guys! The best part is it is all foundation pieced, and all straight lines, so no weird seams. yay! 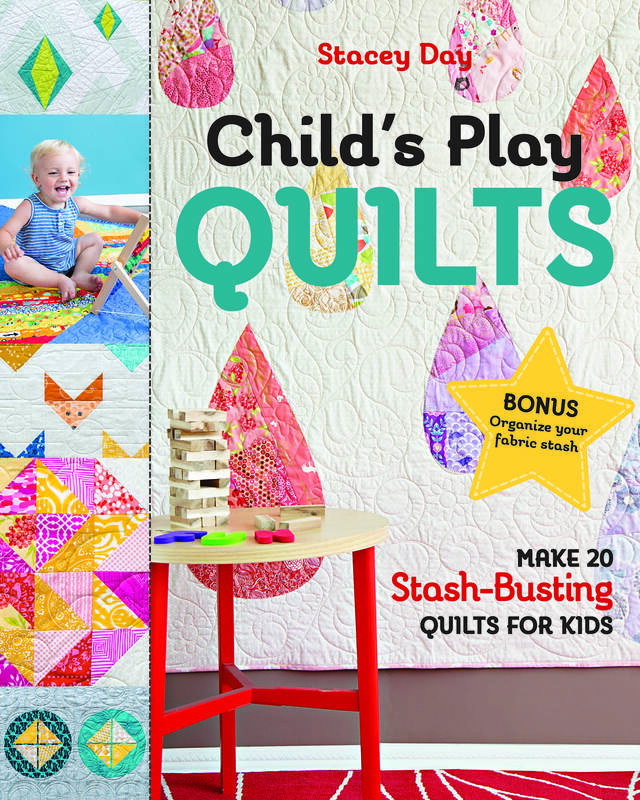 For my American friends, Gotham Quilts has made up kits for this quilt with a backing option and they carry the entire line of Tabby Road. For my fellow Canadians, MyFabricSpot.com has the entire line and some bundles available. I hope you enjoy the free pattern! The only thing better than new patterns is new FREE patterns! yay! I have added some new links in my library of free patterns. 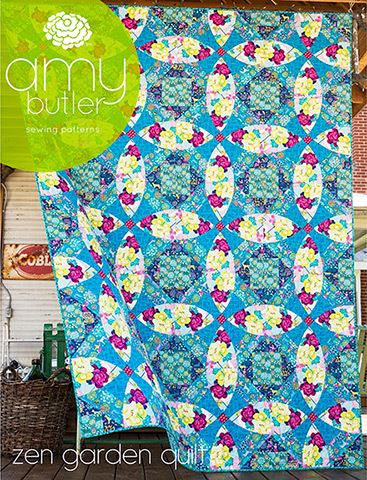 First up- the Splendor quilts for Amy Butler! Splendor was an amazing collection to work with. 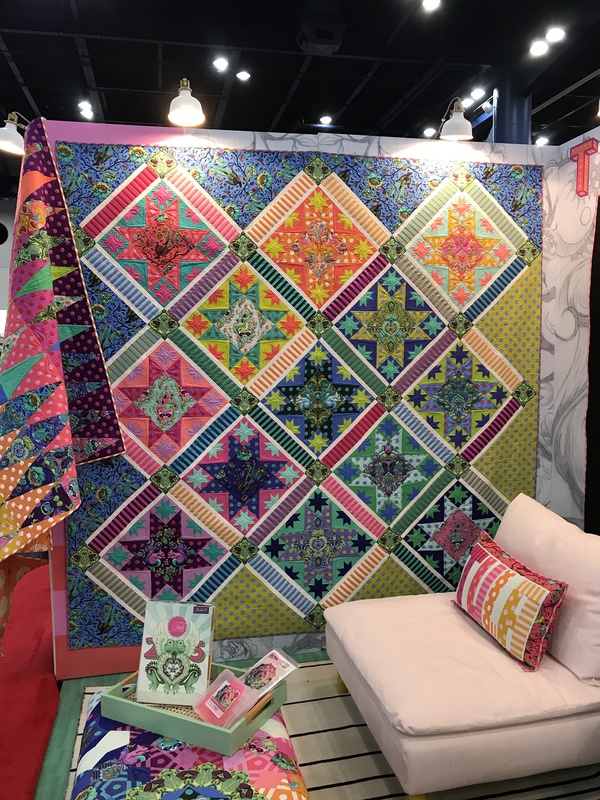 With her signature style and use of color, Splendor definitely inspired more than just two quilts, but these two were the favorites right from the start! Also with Splendor is the full size Clematis Quilt. You all saw the mini that I made for Quilt Market, but the pattern is for the full size. I might have forgotten to take detailed pictures of the quilting for this one in my baby-brain addled state, but I assure you its fantastic. The center star is feathered like the mini, with an added border of zigzags and a row of pebbles. The border is done in swirls and a piano key border. 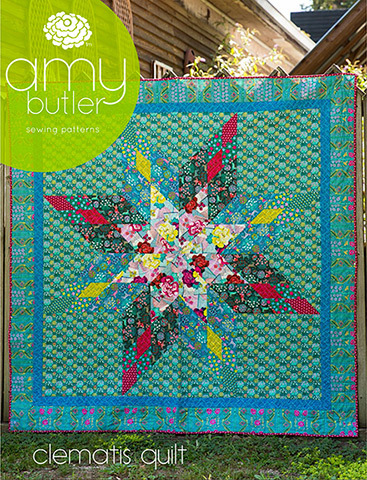 You can see some detailed shots of both quilts, as well as the other lovely projects made with Splendor, on Amy Butlers Instagram account @amybulterdesign. I am currently working on her next collection, and I can guarantee you are going to LOVE them! I know I do! Next up are the Cool Cats projects for P&B Textiles. I love the funky colorful cats, and the second main print is a black and white outline print intended for coloring with fabric markers. How great is that? I came up with a fun, easy quilt and an artist apron. I ended up using my tester apron during my pottery stint a few months back (that I totally forgot to blog about, but you can find my pots on my IG account @staceyinstitches. Pottery is fun!) 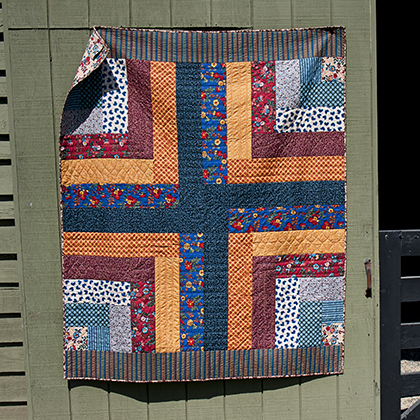 The quilt has a pair of set in 3D strips in the border for a unique look. Clowder – a group of cats is called a clowder, did you know? 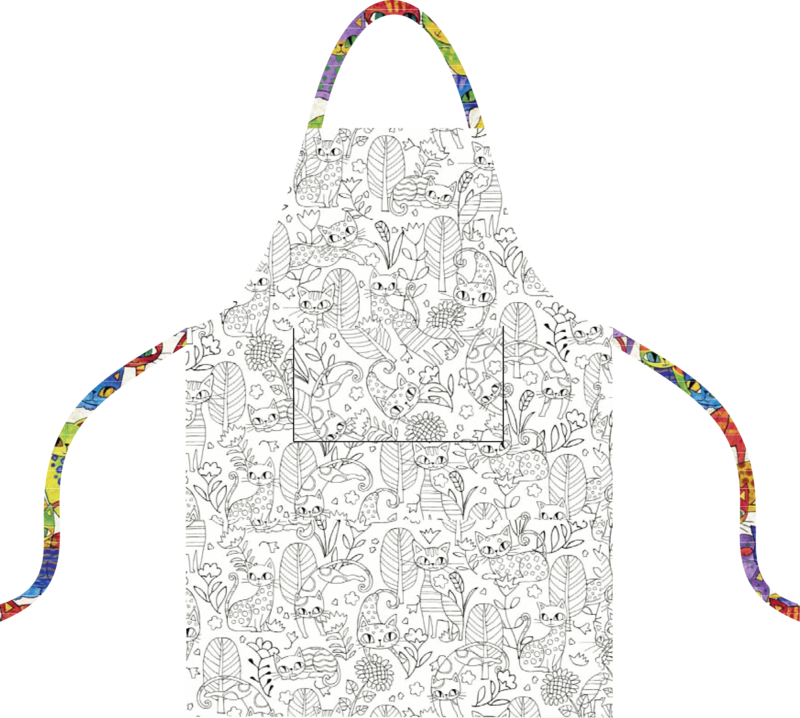 The apron has adjustable straps to be a one -size fits most. Next is a soft and sweet flannel collection called Beaux Bebe. I designed a simple rag quilt that is beginner friendly, and a set of bonus burp cloths. This one will make the perfect baby shower gift set! 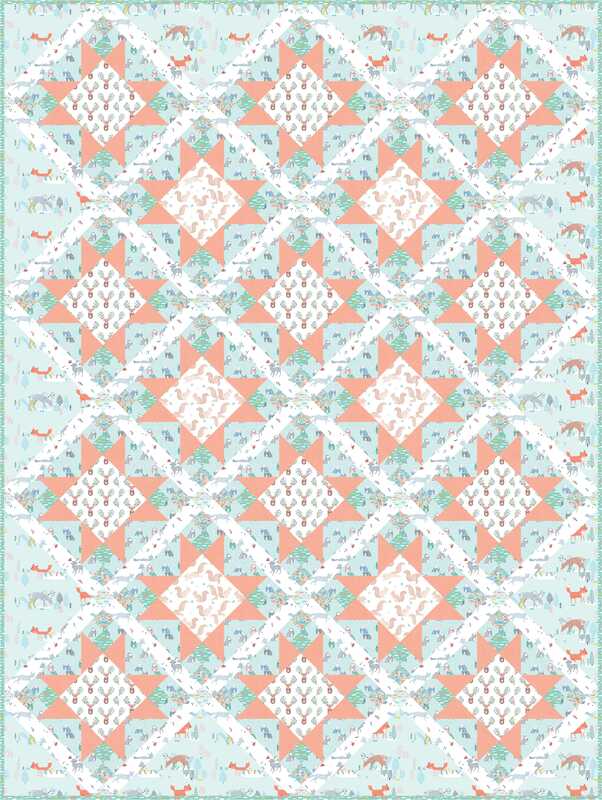 Lastly there is this fun project for Dear Stella- Meadow Quilt featuring Pine Grove, a collection of super cute woodland creatures. The owl print is my favorite! Soon I am also going to be publishing the next pattern from the book that never was. It is going to be a free tutorial here on the blog, so stay tuned! Each pattern can be found by following the link in the drop down menu in the Free Patterns section. Enjoy! Today I finally get to share Slice of Happiness! For Slice of Happiness, I was inspired by a picture of a glass of lemonade. The picture reminded me of warm summer days, sitting in the backyard, sipping a cold drink and having nothing else in the world to do but relax. The 3/4 circles represent both the condensation on the glass, and the slices of citrus inside. 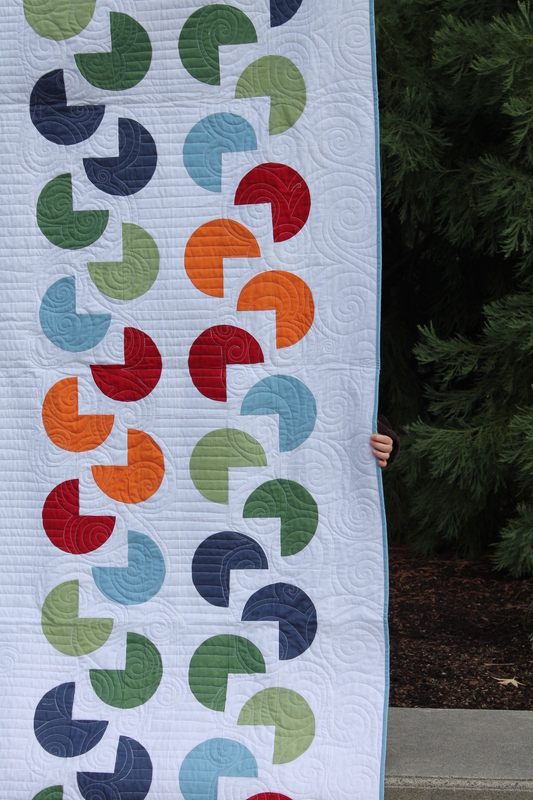 I chose colors that both made me happy and worked well together, and I decided to use a lot of negative space to have fun playing with the quilting. 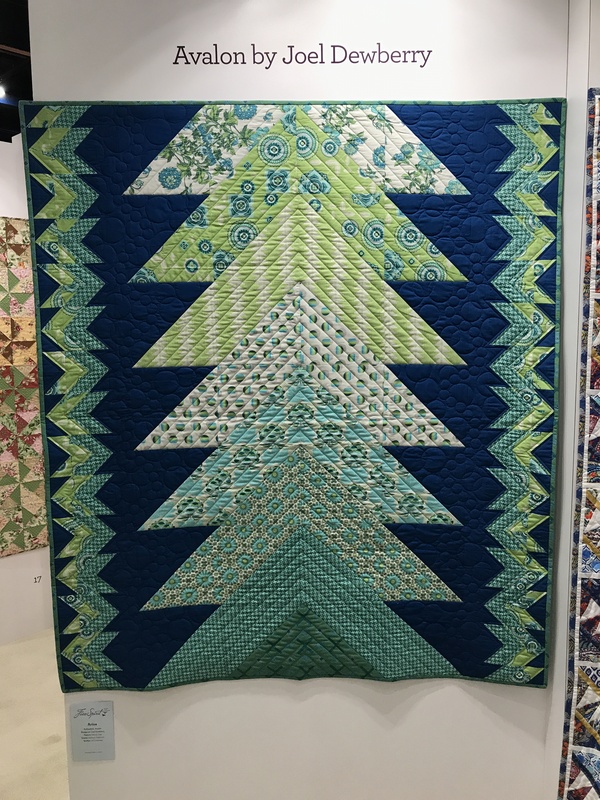 The simplicity of the design works well with any quilting style-from minimalist straight lines to feathered flourished, and anywhere in between. 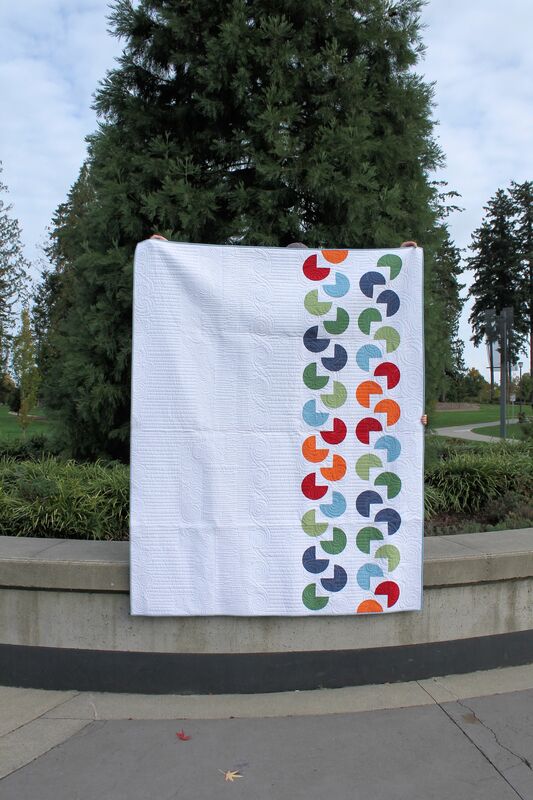 The 3/4 circles look great as solids, but are also the perfect size to let you show off your favorite prints. I’m not sure if you can tell from the photos, but I had the BEST time quilting this one! I used a modified motif that I call Zephyr, which is an allover design of swirls and straight lines combines. I first tried it out on Trade Winds, and then refined the design for Flashy. 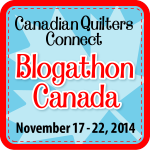 I have used it a few times now on other quilts (to be shown soon!) and its always different every time. I also tried out a technique I learned from Krista Withers. I am not the best at ruler work, so I tend to freemotion most of everything. 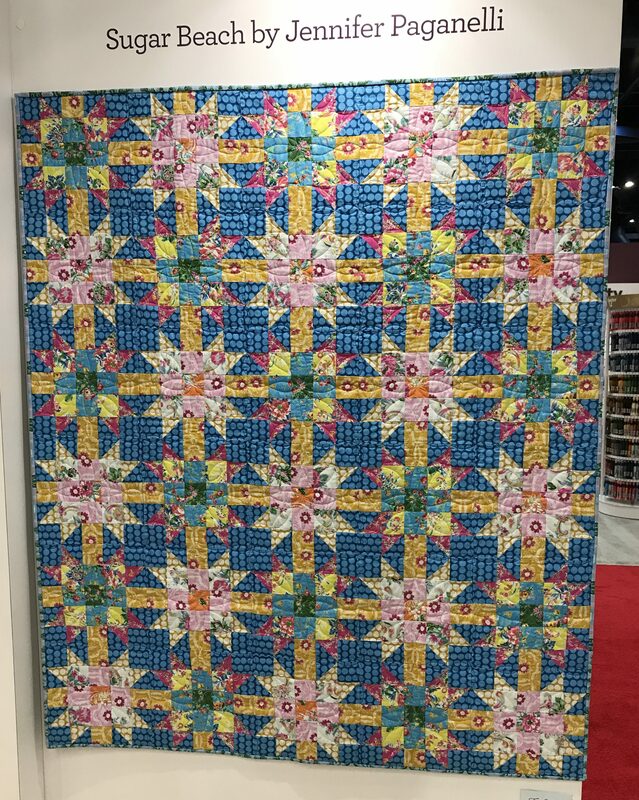 I am definitely going to be making more channels and filling them with pretty fillers in the quilts to come, it’s a great way to break up a quilt. 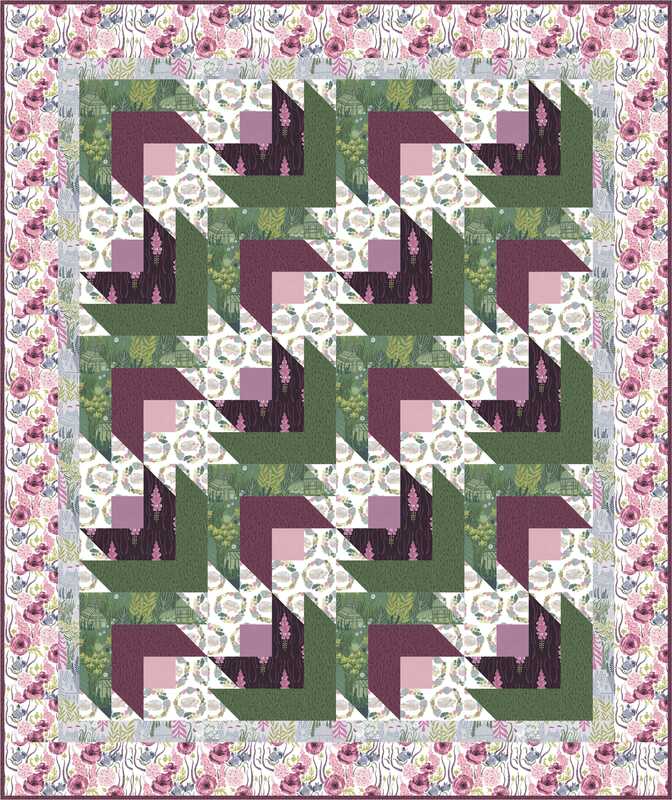 Those of you who are members of the Modern Quilt Guild will be able to download the pattern for free from the Community area of the MQG website. For those that aren’t, patience! 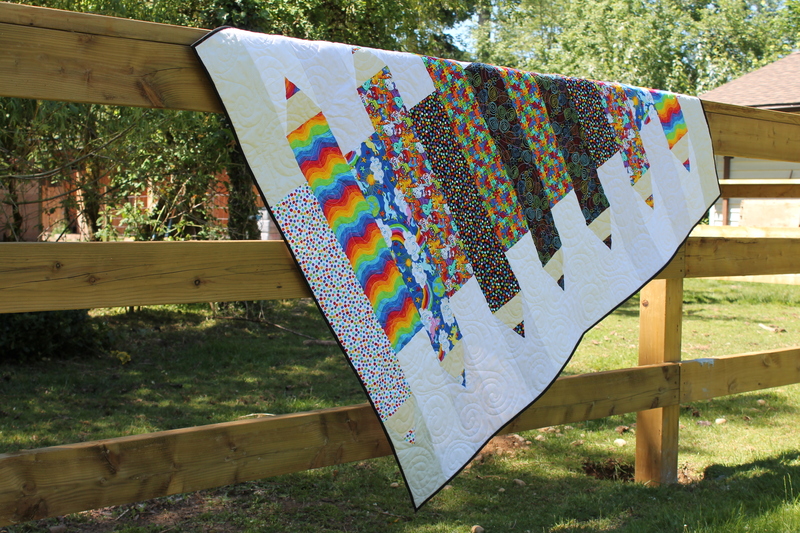 The quilt pattern will be available to everyone from me in about 3-4 months (just be sure to send me a friendly reminder and I will get it up and running!) I am currently working on editing Sunshowers to be available soon. My favorite part of the whole process was when I photographing the quilt. 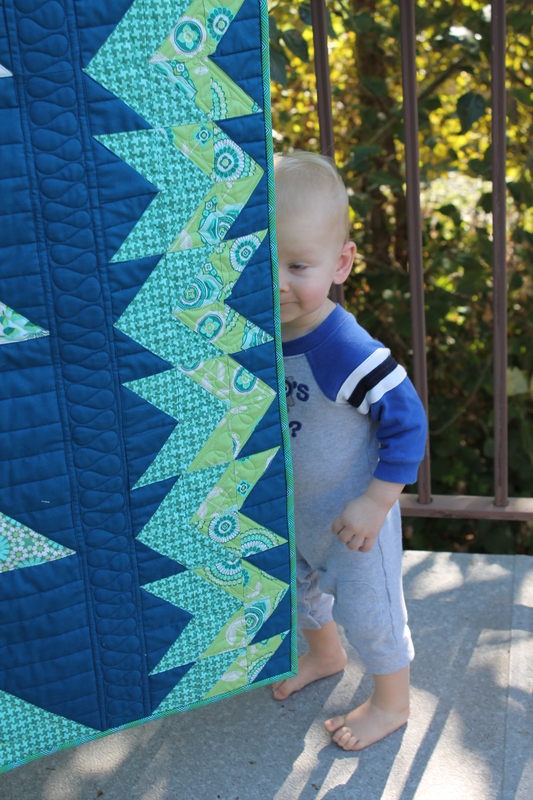 Little H wanted SOOOOO BAAAAAAAD to help hold the quilts, that little hand showed up in every single shot. And I love it! I hope you all enjoy making your Slice of Happiness quilt! I love to see pictures, so make sure you tag me on Instagram @staceyinstitches or send me an email!